FILE - Employees work at their desks at a Sina Weibo office in Beijing. A massive backlash on social media in China has apparently led the United Nations to take down two Lunar New Year posts on refugees and poverty from their Chinese Weibo social media site. The microblog messages appeared to be aimed at boosting awareness, but many took the posts as a slight to China, arguing that the world's second largest economy has already done enough to contribute to the UN and was not a source of the problems - be it refugees or poverty. In the first message that went up on the eve of the Lunar New Year, the U.N. post asked: “Dear, have you had your Lunar New Year’s dinner yet? It must have been some feast!” The post went on to talk about how some 800 million people in the world struggle with starvation every day and that the same number live in extreme poverty. The post also noted that $250 billion in funds is needed from around the world to achieve the U.N.’s sustainable development goal of eradicating poverty by 2030. Before it was taken down, the video was viewed more than 10 million times and received more than 54,000 comments. Most were negative and many urged the United Nations to not send such messages to China, especially during the holiday season. A post by MarcelZ that was liked by 21,000 argued that China was already doing plenty to help this ‘other world’ that the United Nations was sharing with the Chinese public. 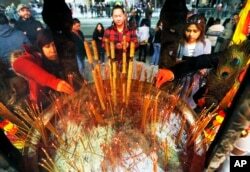 Celebrants light incense at the Thien Hau temple in Los Angeles, Jan. 28, 2017, the first day of the Lunar New Year - the Year of the Rooster. Although neither of the posts suggested China was to blame, many Chinese saw them that way and argued that the United States and the west were the ones who should be receiving such messages on Facebook during their holidays. “This is like sending pictures of a funeral during a wedding,” one noted. The same post was not found on Christmas or New Year’s Day on the UN’s social media or Facebook sites. But on Twitter on Christmas Day, the United Nations did have two similar posts, one about Syria and another on poverty. Social media sites such as Facebook, Youtube and Twitter are blocked in China. VOA was unable to reach the U.N. in Beijing for comment about the online uproar, but such messages about global challenges are common on U.N. social media sites. In addition to the postings about refugees and poverty, the U.N. also posted several messages to mark the Lunar New Year, including a video from Secretary General Antonio Guterres in which he highlighted what he said was the vital role that China plays. Most of the comments in response to the video, however, continued to vent anger and frustration with the posts that had been removed. 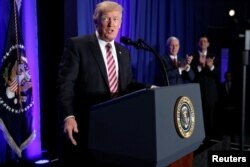 FILE - U.S. President Donald Trump is applauded by Vice President Mike Pence and House Speaker Paul Ryan as he arrives to speak at a congressional Republican retreat in Philadelphia, Jan. 26, 2017. The online commotion comes at a time when U.S. President Donald Trump is facing mounting criticism at home over recently enacted immigration policies, and as China looks to play a bigger role on the global stage. Reports have suggested that the Trump administration could make major cutbacks at the United Nations and Chinese officials are already beginning to hint Beijing is ready to fill the power vacuum that would leave in its place. But so far, when it comes to money and playing a bigger role, the Chinese public seems hesitant and divided. When Chinese President Xi Jinping delivered his first address to the United Nations in 2015 and pledged $2 billion for debt relief and assistance to poor countries, critics at home argued he had gone too far, noting that China still has millions of its own at home who live below the poverty line. Over the past six decades, China has said it has contributed nearly $60 billion in aid to 166 countries and organizations around the world. But that’s less than what the European Union and its members give each year. And when it comes to refugees, China has largely viewed the crisis as a problem created by Western nations. In 1982, China ratified the United Nations Protocol Relating to the Status of Refugees. However, it was not until 2013 that a law went into practice that allowed public security officials to issue identification cards to refugees and asylum seekers. Is the Rohingya Situation Improving in Myanmar?